As a STOTT PILATES® Licensed Training Center, The Pilates Body allows you the flexibility of training in Mississauga at our fully equipped studio, or delivering STOTT PILATES® world-renowned certification courses and workshops on-site at your facility. At The Pilates Body, courses are taught by highly skilled STOTT PILATES Certified Instructor Trainers in a professional and friendly environment. stottpilates.com/advantage to review the exclusive benefits available to STOTT PILATES Certified Instructors. STOTT PILATES certification shows clients and employers that you are a well-qualified professional. At the conclusion of each course, you receive a letter of completion and continuing education credits. STOTT PILATES certification is awarded upon successful completion of a course plus a written and practical exam. Exam material is cumulative so students can certify in stages by taking an exam after each course or after a series of courses, e.g. students certified in Matwork must take a combined Matwork and Reformer exam should they wish to subsequently certify in Reformer. This also applies to students certified in Reformer who wish to move on to CCB certification. To maintain certification and stay up-to-date on skills and programming techniques, STOTT PILATES has implemented a Continuing Education Credit (CEC) program for certified instructors. For upcoming CEC workshops, please view our Certification Schedule and refer to stottpilates.com/workshops for complete descriptions. A minimum number of hours of observation, practice teaching and physical review are required for all courses and should be completed between instructed sessions at any STOTT PILATES facility. Additional training may be required to prepare for certification. 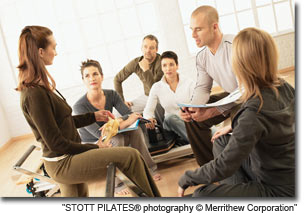 Observation includes watching sessions taught by a STOTT PILATES Certified Instructor or relevant STOTT PILATES videos. Practice teaching hours can be fulfilled by instructing family, fellow students, friends or clients. A physical review means physically performing the exercises learned in class. Taking a class with a STOTT PILATES Certified Instructor or working out with a video can qualify as physical review hours, and can be completed individually or with other students. Practice teaching and physical review hours must be logged outside of class time and submitted at the time of the practical exam. Intended for those already working in the fields of fitness or movement, the STOTT PILATES Intensive (Level 1) program focuses on expanding current knowledge while delivering complete instruction in STOTT PILATES principles and Essential and Intermediate exercises in a faster paced format. IMP provides you with the solid foundation and skills you need to develop effective and motivating personal training programs. This course teaches you to design and teach the Level 1 (Essential and Intermediate) Matwork repertoire, integrating light equipment to meet the specific needs of your clients. This course teaches you how to design and instruct Level 1 (Essential and Intermediate) Reformer workouts in a personal training setting for a range of clients. While IR may be taken prior to IMP, we recommend completing IMP first. fine-tune personal and circuit training programs to meet a variety of clients’ conditioning goals with 125 exercises on the Cadillac Trapeze Table. ICHR prepares you to teach Level 1 (Essential and Intermediate) exercises on the Stability Chair. By the end of this course you will be able to fine-tune personal and circuit training programs to meet a variety of clients’ conditioning goals with 63 exercises on the Stability Chair. This one-day course progresses to more advanced material, providing further options and challenges on the Mat for highly conditioned clients. Exercises require a high degree of strength, balance and coordination. Participants will learn 13 exercises and advanced modifications. Learn to use the various Reformer components and accessories to intensify the Reformer repertoire and provide a stimulating workout for athletes, dancers, and highly conditioned clients. Exercises require greater strength, stability and flexibility. Participants will learn 70 new exercises and exercise variations. Advanced Cadillac Chair & Barrels course has been restructured into three separate modules to allow you to choose which element to take, and when (they may be scheduled consecutively). Completion of all three modules is required to be eligible for certification. ACAD prepares you to teach 28 Advanced level exercises plus modifications using the Cadillac for the highly conditioned client. ACHR provides you with 14 Advanced level exercises plus modifications using the Stability Chair for the highly conditioned client.